Don’t take our word for it, read what our customers have to say about our pens. I have purchased a number of fine pens from King Pens. I kept a couple and gave others away as gifts. I am very satisfied with both their look and quality. I wanted to give my testimony about the pens from King Pens. I have three pens in my possession. I also bought one for a friend and they are exquisite gifts. The workmanship is incredible on them & they write beautifully. They fit good in the hand when I’m writing a letter or a note. The ink flows beautifully. I have not had any problems with these pens. Scott does extraordinary work on them I would recommend them highly for any occasion in the gift giving or special event coming up. These are works of art and make a good conversation piece. I’m looking forward to buying my next pen which I would like to be a fountain pen. Kings are smooth writing instruments and feel right in my hand. Smooth point actuation of good looking designs. I own multiple King Pen styles. I’ve had MANY comments about the pen you made. It shows great craftsmanship and design. I am EXTREMELY happy with mine and you can quote me on that! 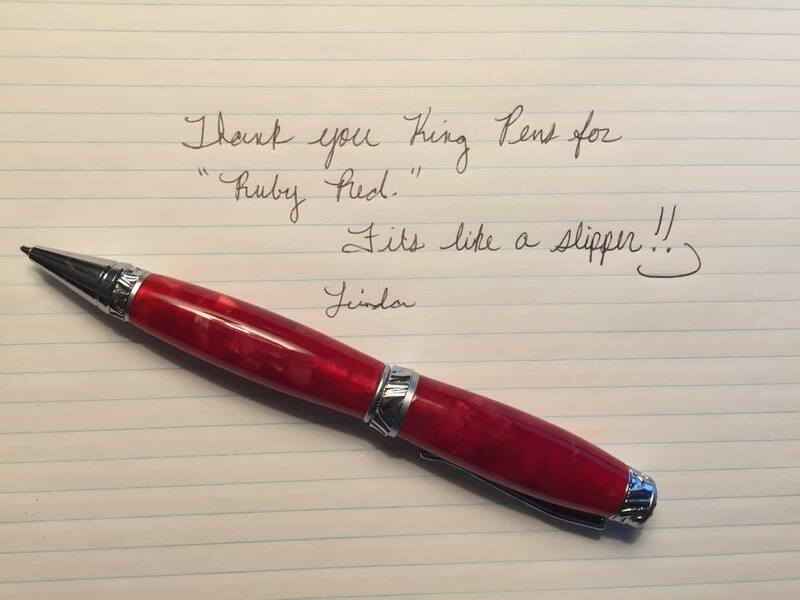 I received my first King Pen ballpoint pen as gift last year. I must say that I am not really a pen fan. I hardly ever use one as most of my signing is done on-line. Electronic banking has also replaced check writing for me as well. However, I am very impressed with my pen gift. I‘ve had many pens over the years and was never really completely happy with the way any felt in my hand. Some were too fat while others were too thin and would slip through my fingers. This particular King Pen fits perfectly and yields a much smoother writing experience. The quality of the workmanship is superb and very impressive. It is obvious that only very high quality materials make up these fine pens. Ink quality is very important to me also. The ink is applied smoothly onto the paper and does not smear. The ink is completely smudge-proof which, for a left-hander like me, is of paramount importance. This pen feels great and looks great. I highly recommend King Pen ballpoint pens for personal use or as a gift for others.